How do you like your eggs in the morning? We're not sure about you, but we here at Real Homes like ours made in the best egg cooker you can buy. Whether you've a soft spot for boiled eggs, you can't get enough of poached eggs on toast or you love a fancy omelette on a Sunday, we've rounded up the most egg-cellent egg cookers to add to your kitchen cupboard. Can't decide on your favourite way to eat eggs? Thanks to this multi-purpose egg cooker, you won't have to. It can boil up to six eggs at one time ranging from soft to medium and hard, and it can also poach two eggs or make an omelette. It's very easy to use, comes with instructions and recipes included and it has dishwasher safe parts making it easy to clean. Best bits? It's compact and easy to store, but it also cooks eggs perfectly every time. 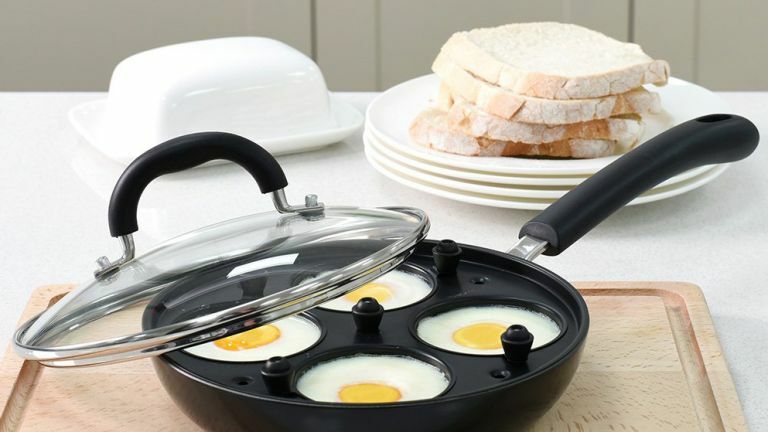 This 20cm egg poacher has the space to cook up to four eggs at a time and because it's made from coated 3.5mm aluminium, even heat distribution is guaranteed, meaning all your eggs will be cooked exactly the same. One of its best features is its five star ProCook Ultra double layer PFOA free non-stick coating. We love that it's so easy to use and clean, as it's dishwasher safe, too. The best egg cooker you can buy if you're a poached egg lover. Hate cooking more than one fried egg because they all merge together? Enter the Uarter Egg Frying Pan. Equipped with four cavities, it can fry up to four eggs at once and it has a non-stick coating as well as a heat-resistant handle. It's made from high-end aluminium alloy so is ultra safe on all cookers other than induction, and it's practical to use. You could also use it to make mini pancakes, too. In our opinion, this is the best egg cooker for fried eggs. Always fancy eggs for breakfast but don't always have the time? This pack of two microwave egg boilers can cook eggs in just 20 to 30 seconds so you don't have to wait around. There's also no shell to worry about, as you crack your eggs directly into the cups, so they're ready to serve as soon as they come out of the microwave. They're also BPA free and dishwasher safe, making them the easiest and best way to enjoy your boiled eggs. Not only can this omelette maker cook up a meal in just five minutes, but it can also be used to scramble or fry eggs. With non-stick cooking plates for easy cleaning and fuss-free removal, as well as a non slip feet, the machine features a compact design and a cool touch housing. One of the best egg cookers around and an easy route to the perfect omelette, we think.